When one fully understands the deplorable economic and housing conditions at the Navajo Nation, it is not surprising to find the largest geographic concentration of poverty in the United States to be centered in Northeast Arizona. The map at right shows the 3,140 counties in the United States with the lowest 100 per-capita-income counties highlighted. Apache County (10th lowest per-capita-income) and Navajo County (85th lowest per-capita-income) form the heart of the Navajo Nation. What is even more startling is the fact that the most impoverished portion of the Navajo Nation is actually to the west in Coconino County in a region today known as the Former Bennett Freeze Area (FBFA). When then-Bureau of Indian Affairs (BIA) Commissioner Robert L. Bennett enacted the Bennett Freeze in 1966, it was intended to address an ongoing land dispute between the Navajo and Hopi Tribes after the Hopi Tribe sued to claim some acreage. The result of the Freeze was to place a moratorium on all development activity on land that covers all or a portion of nine Chapters of the 110-Chapter Navajo Nation. Although the “freeze” was lifted in 2006, virtually no investment in community, economic or housing development has taken place since 1966—over 50 years! The purpose of the Native Builders effort, (hereinafter “Effort”) is to generate the capacity desperately needed at the Navajo Nation to reverse the decades-long effects of poverty, poor housing and the federally-instituted moratorium on development. 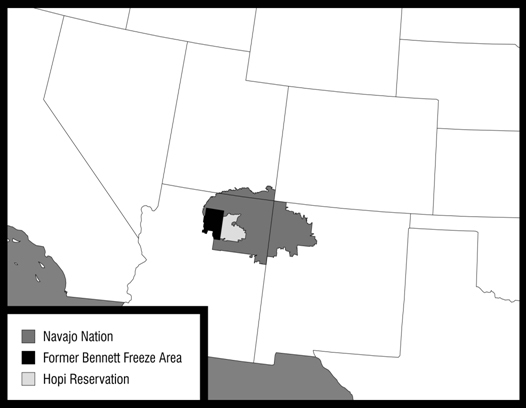 At 27,425 square miles, the Navajo Nation is the largest tribal reservation in the United States. The Navajo population, estimated at 300,048, is the second largest Native American population in the United States (second to Cherokee Nation). Yet despite its size and population, the Navajo Nation has rarely availed itself of federal capacity building programming due to a lack of ability to competitively apply for and engage such programming. One outcome of the Effort will be to systematically increase capacity for the entire Nation while focusing on the FBFA. This Effort coincides with a broader initiative by the Russell Begaye/Jonathan Nez Administration. The new Administration assumed office May 12, 2015. The Administration’s initiative identifies four “pillars” and nine “priorities” as shown in the graphic. The scope of this Effort will, in effect, fully address the pillars and priorities for the nine FBFA Chapters. The result of the Bennett Freeze has been to restrict all forms of development activity. Not only has such development activity been stopped, but the mindset of the people in the FBFA has been to generally accept that no development will ever occur. Houses will never be fixed. Homes will never be built. Roads will never be constructed. Power will never serve residences. Indoor plumbing will never exist. The only housing development that can be expected is the relocation of the outdoor outhouse when such necessity arises. How do you conduct community, economic and housing development activities in a region which has suffered for a half century from a federal restriction making it illegal to conduct such activities? The federal moratorium on development activity may have ended in 2006, but needed federal and tribal funding has not arrived to reverse the problem. Until now. In 2015, Native Builders LLC reached out to a National non-profit, the Native American Youth and Family Center (NAYA), to successfully apply for a $250,000 grant from USDA Rural Development through their Rural Community Development Initiative (RCDI) program. The grant award, to be matched by Navajo Nation, creates a “train the trainer” dynamic whereby federal resources will be utilized by NAYA to train Native Builders to deliver key services to the people of the FBFA. Capacity will be built through the provision of technical and financial assistance provided by NAYA to Native Builders. Despite the development moratorium and lack of development capacity, a local governance structure is in place in order to target capacity-building activities. At the Navajo Nation, local governance is managed by Chapters. The figure shows the six training courses and how NAYA trains Native Builders to deliver capacity to the nine Chapters. The services are essential in order to create housing, community and economic opportunity for the people of the FBFA. 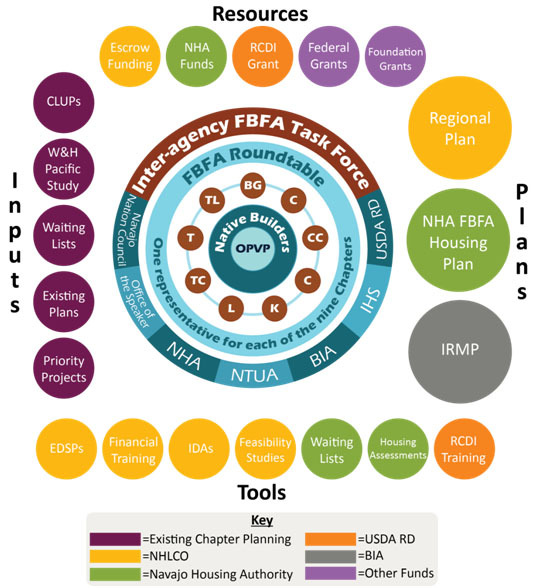 One very key player in assisting the FBFA is the Navajo Housing Authority (NHA). In 2017, NHA is engaging the services of architectural and engineering firms to assess housing conditions and to place new modular housing in the FBFA. In addition, NHA is leading an effort to make modifications and improvements to existing housing stock in the FBFA. Native Builders looks to coordinate the USDA RD federally-funded Effort with the NHA in order to best utilize financial and human resources. In addition, Native Builders looks to offer its skills and services to engineers and contractors assessing and building new housing in the FBFA. Another key Navajo Nation group with resources to help the FBFA is the Sihasin Sub-Committee of the Naabikiyati Committee of the Navajo Nation Council. The Sihasin Committee is working to leverage its funding with federal funds in order to develop infrastructure benefiting the Navajo Nation. An opportunity exists to leverage the USDA Rural Development grant and set the stage for additional successful federal grant awards in 2017 and beyond. Ultimately, Native Builders is advocating for the creation and implementation of the FBFA Master Planning Process. The graphic to the left, and this presentation, presents a game plan so that the “inputs” and “resources” available to the FBFA generate “tools” and “plans” for the betterment of the people of the FBFA. The efforts of Native Builders have already established the designation of the FBFA as a Community Economic Development region by USDA Rural Development. This designation increases the competitive posture of the FBFA and Navajo Nation to get additional federal funding for housing, community and economic development. Fostering collaboration amongst all of the resource providers (USDA RD, NHA, Navajo Nation Council, Office of the Speaker, NTUA, BIA and IHS) is the ultimate vision of Native Builders.